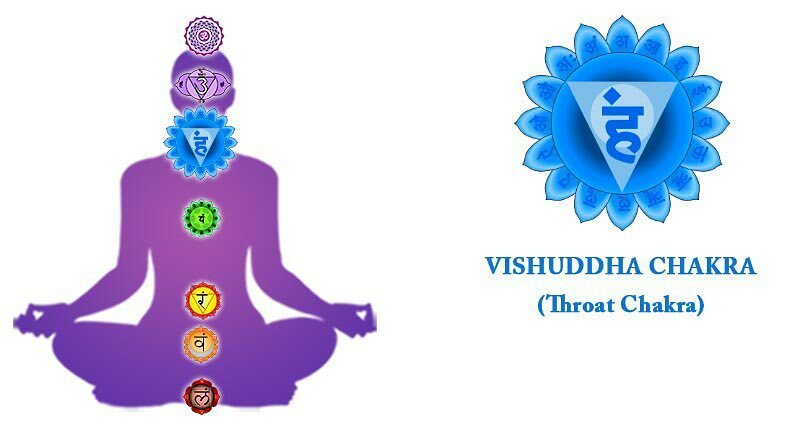 The Vishuddhi chakra is located in the throat area. It is depicted as blue or turquoise in color. This Chakra is closely related to Purification and Healing. Vishuddhi chakra is associated with thyroid and parathyroid glands. Hence meditation and awareness on this chakra can heal issues and diseases related to thyroid. it is also associated with Neck, Shoulders, Arms, Hands. Similarly, a meditation on this chakra can also heal Neck, Shoulder, ARM, and Hands. When there is an imbalance or blockage in this chakra, it can result in Thyroid related issues, psychological imbalances, metal blocks especially affecting creativity and also general issues in communication, and can also cause a lack of confidence in yourself or in other words it can make you think unsure about yourself. 1. Sit Down in comfortable spine erect posture, eyes closed. You should Face North Direction. Be in Dhyana Mudra – Rest hands on your lap, palms facing upwards should be on top of one another. Place your right hand underneath your left hand and gently touch the tip of the two thumbs. 2. Disconnect yourself from all worldly thoughts and concerns. (Still, if thoughts come let them come and go, but don’t serve them coffee and tea). 3. Slowly bring your Awareness to the place of Vishuddhi Chakra and lock your awareness there. Meditatively chant HAM as it is the seed sound of this chakra. You could also meditate on any other hymns u feel comfortable with. Importantly whatever hymn u will use to meditatively chant you imagine as though each and every cell in your body is vibrating in the Hymn. This will lead to purification and healing from Cell level. This needs to be done minimum 15mins to 30mins every day. 4. If you would want to visualize the chakra also while meditating, then u could visualize it as the lotus in blue or turquoise with 16 petals. NOTE: Doing any meditation between 4 am to 6:30 am has accelerated benefits in many aspects, as the cosmic energy is at its healing best during these hours.